DVD Audio Ripper for Mac - Best DVD to MP3 Ripper, Rip Audio from DVD on Mac. DVD Audio Ripper for Mac, easily rip DVD to audio MP3, WAV, AAC. 3herosoft DVD Audio Ripper for Mac is very useful and easy to use Mac DVD Audio Ripper which can rip and extract audio from DVD for Mac OS users. With this Mac DVD audio ripper you are able to convert DVD audios to MP3, MP2, M4A, WAV, WMA, AAC, AC3, OGG, RA formats with excellent sound quality. 3herosoft DVD Audio Ripper for Mac lets you easily extract audios form DVD and convert them for playback on iPad, iPod touch, iPod nano, iPod shuffle, Zune, PSP, iPhone, iRiver, Archos, Creative and mobile phones. 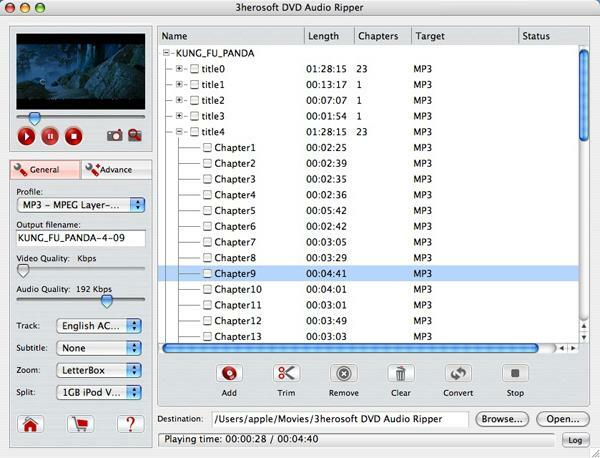 3herosoft DVD Audio Ripper for Mac has strong function of editing options, such as movie trimming, video and audio encoder settings, and batch conversion and so on. This DVD Audio Ripper for Mac software provides a series of powerful functions for Mac users to edit the output audio, such as choose the audio of any chapters or titles of your DVD to convert to MP3, select the DVD audio track, trim clip, view DVD information, edit MP3 ID tags and more. Free Download 3herosoft DVD Audio Ripper for Mac and have a try! You will have a wonderful experience in traveling your music world now! Rip audio files from DVDs and save them as MP3, WMA, WAV, M4A, AAC, AC3, and OGG. Support dual-core or multi-core CPU to maximize the conversion speed. You can get DVD info online like Album, Artwork, Album Title, Artist, Producer and more. Split one large file into several smaller audio clips and rip audio clips with different profiles. Get the audio quality with some parameters to adjust, such as Duration, Sample Rate, Bit Rate, Channel, Audio Quality. Edit ID3 tag for MP3, WMA audio like Title, Author, Album, Genre, and Composer to manage your own music. Able to copy title or add diverse profiles for different sources and convert them only once with just one click. DVD Audio Ripper for Mac allows you to choose your favorite audio track and subtitle for the output files. Press "Trim" button to trim segment by setting start time and end point or drag the slide-bar to confine the trimmed area. With multithreading and batch conversion function, this DVD Audio Ripper for Mac is able to rip several DVD or titles at the same time. Let the DVD Audio Ripper for Mac run in the background without slowing down your computer. How to rip DVD to MP3 audio files on Mac for enjoyment?